15 Mar ADVERTISING ON FACEBOOK, HOW WE TURNED $5,000 INTO $76,000! This is the first post in a series that will go over the details of how we are able to get such a great return in only a few months. This post is intended for the true beginner. There’s a ton a info floating around the internet about whether or not Facebook advertising works or not with different niches and industries, the results we are going to talk about came from 3 completely different industries using completely different strategies, which we will go over in future posts. We are by no means the “end all be all” of Facebook advertisers, but hopefully this can answer a few questions you might have and give you a good starting point and help you avoid some pitfalls along the way. 1 – Before You Can Start Advertising On Facebook Build A Website. The first step may seem obvious but if you choose the wrong one it can cause unnecessary problems in the future. We strongly recommend using WordPress or Shopify. WordPress because it’s open source and most plugins are free and it is about 30% of the entire internet, so very well tested and trusted. It also works well for SEO building and it vary scaleable! Shopify is also good because it is for the less tech savvy person that wants to do it themselves and save some money. There are potentially more costs in the future with plugins but still a very good choice for ecommerce. 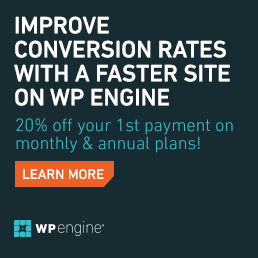 *A quick note on hosting your website, we exclusively use WPEngine. This is for a lot of reasons you can read here. But short story, save yourself some headaches and use them. 2 – When You Are Advertising On Facebook Creating A High Value Offer Is A Good Idea. A good offer takes strategy, if you’re an ecommerce store you’ll want to have good enough margins to create a sell that’s worth someone clicking through to purchase. A 10% discount usually isn’t enough for a new customer to click through, but you throw a 50% discount at someone and most people will look at it even if they’re slightly interested. Make sure your offer is really an offer, don’t raise your prices and offer a 50% discount all the time. In our experience about once a month you can do a big sale for about a week or so then raise prices back to regular for the rest of the month. This creates real scarcity. *Note your content has to be equally as good, we will go over content in detail in the next post. 3 – Research Your Facebook Audience. This step takes some time but can make or break your whole campaign. Use Facebook’s audience insights tool found in ads manager to find relevant pages and interests as well as demographics as a good starting point. We also use spyfu.com and similairweb.com to check out the competition to see what they’re doing and what’s working. We’ve used this method to find audiences and turned $300 in adspend into $7,100 in revenue in only 1 week during our testing phase! That is a best case scenario, we’ve used the exact same method and gotten nothing out of the gate. Which leads us to the next step. 4 – Use Facebook Targeting Testing. Sometimes your educated guess from step #3 pays off immediately sometimes it doesn’t, either way this step needs to be taken. That is testing. When we are setting up interest testing ads we will put up 5-10 ads. All the same copy and image just with different interest in each adset. Setting them with about $5-10/day you can quickly find out which people are interested in you ad and which ones aren’t! *Tip, setup all the ads to point to the same post on your Facebook wall. That way all the comments and engagements will show up on the same post and build some social proof. 5 – Use Facebook Analytics to Drill Down Your Purchasing Audience. After you’ve run your ads make sure to go into the analytics to where the clicks and purchases are coming from. These analytics are located on Facebook and Google and will help you refine your ads targeting and get you bigger returns (ROAS) and lower your cost per purchase all at the same time. We’ve been able to see ROAS as high as $70 to $1 using these analytics! Let the analytics tell you what is working and what isn’t. Don’t get hung up on your personal preferences if they aren’t working. That’s the overview of what we do, each industry in different just keep in mind to let the data tell the story, and go from there. Our next post will start diving deeper into these methods and give some examples. Contact Us If You Want Help With Your Campaigns. Hey where in the article do you talk about how you made $76,000? I’m curious to learn more. Great question! This is the first blog post in a series and is only intended to give the overview. The next blog post will go into more details on specific parts and the principals we use to generate good returns.